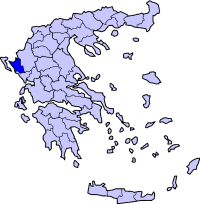 Margariti (Greek: Μαργαρίτι) is a village and a former municipality in Thesprotia, Epirus, Greece. Since the 2011 local government reform it is part of the municipality Igoumenitsa, of which it is a municipal unit. Population 3,032 (2001). In February 1913, Margariti was taken by the Greek army and joined Greece following the Treaty of Lodon. During that period all village elders of the region gathered and declared that they would resist the incorporation of the area into Greece. At that time the town had a mixed population of Greeks and Cham Albanians until the final expulsion as a result of the Cham collaboration with the Nazi occupation forces. Almost all Cham Albanian monuments of Margariti were destroyed during WWII. Jakup Veseli, representative of Chameria in Vlora Congress, signatory of Albanian Declaration of Independence. Konstantinos Zakas (1916-1986) Greek Army General. ^ Leon, George B. (1990). Greece and the First World War: from neutrality to intervention, 1917-1918. East European Monographs. p. 353. ISBN 9780880331814. Retrieved 1 November 2010. ^ Kiel, Machiel (1990). Ottoman architecture in Albania, 1385-1912. Research Centre for Islamic History, Art and Culture. p. 3. ISBN 9789290633303. Retrieved 1 November 2010.